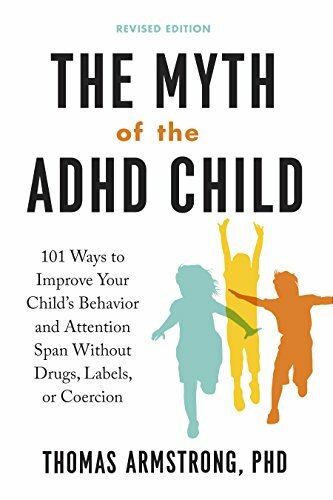 The title of my new book is The Myth of the ADHD Child, and some people might get upset and think that I am saying that their disorder or their kids’ disorder simply doesn’t exist. I say no such thing! As a former special education teacher, I know that the symptoms associated with a diagnosis of ADHD—hyperactivity, distractibility, and/or impulsivity--are very real indeed! So let me clarify what I mean when I say that ADHD is a myth. I’m using the word ‘’myth’’ in its original sense of the term in Greek, which is mythos, meaning ‘’story.’’ So I’m talking about ADHD as if it were a story. It’s a story that has been developed over the past three decades about why certain people are inattentive, fidgety, spacey, disorganized, impulsive and/or hyperactive. The plain truth is that I don’t think it’s a very good story. There are plenty of inconsistencies. The main one, in my view, is the fact that professionals can’t seem to agree on how many kids have the disorder. The DSM-5, which is the official manual of the American Psychiatric Association, says 5% of kids have ADHD. The International Classification of Diseases, which is used instead of the DSM-5 in many parts of the world, uses an entirely different term – hyperkinetic disorder or HKD—and concludes that the prevalence is 1-3% of all kids. The Centers for Disease Control in Atlanta, says 11%. The prevalence also differs by state. In Nevada 5.6% of all children are diagnosed with ADHD, while in Kentucky that number jumps to 18.7%. That’s a lot of variation! I think one of the reasons for the huge differences has to do with the fact that there is no objective diagnostic tool that can definitely say whether someone has ADHD or not. Instead, the decision about who is ADHD relies mostly on subjective judgements. The most commonly used tool—behavior rating scales—which are used in 90% of the diagnoses of ADHD, ask simple questions about behaviors, whether a child has sleep problems, whether he forgets his homework, and so forth. The answers to these questions depend heavily on context. A child might forget homework whenever he dislikes the assignment, or because the teacher gives the assignment at the start of the day instead of at the end, or because the dog ate his homework (sorry, just joking about this last one!). The point is, that ADHD is a psychiatric diagnosis—that’s serious stuff—and to make this diagnosis hinge upon the subjective judgements of teachers and parents is very iffy to me. Advocates of the ADHD story usually emphasize the gravity of the disorder by pointing out that there are thousands of studies indicating that ADHD is a brain-based disorder, probably of genetic origin. I agree that there are brain differences between many kids diagnosed with ADHD and typically developing children, but the key word here is ‘’difference’’ not ‘’disorder.’’ Recent studies, for example, indicate that the brains of kids’ identified as having ADHD develop normally, but lag behind typically developing kids by two to three years. This finding has huge implications for many of the other brain studies that have been done over the past twenty years especially those which have discovered problems in the executive functioning areas of the brain that govern planning, organization, inhibition, and goal-setting. In kids diagnosed with ADHD, these areas of the brain (in the prefrontal cortex behind the forehead) are developmentally delayed and thus are apt to be less functional than so-called normal children. Another issue related to brain studies is that these brain differences can be due to environmental effects such as early childhood trauma, adversity in the family, and even growing up in poverty (in fact several studies have suggested just that). Advocates of the ADHD story also emphasize the genetic nature of ADHD, with the implication that this disorder is heritable and thus hard-wired into the DNA of ADHD-identified children. Such arguments, however, ignore the fact that recent trends in genetics have focused increasing attention on how the environment can affect which genes are turned on and which are turned off (a phenomenon known as ‘’epigenesis’’). In one study, a gene-environment interaction was noted where a child with a specific genetic mutation would develop behavior disorders under conditions of parental criticism. That means if the child is in a family where the parents are supportive and helpful, this particular gene will not be expressed and the behaviors will not manifest themselves. One final problem that I have with the ADHD story is that many kids with the diagnosis also have diagnoses with other mental disorders such as depression, autism, anxiety, and bipolar disorder—a situation referred to as ‘’co-morbidity.’’ In fact, one study in Denmark noted that 52% of all kids with an ADHD diagnosis had at least one other disorder. The raises the following question in my mind: if a child is both depressed and ADHD, where does the one disorder stop and the other one start? How do we know for sure whether it’s not the depression alone which causes the inattention, impulsivity, and/or hyperactivity? These are also symptoms of depression in children. All of these issues, to my mind, suggest that we should be critical in thinking about the validity of ADHD, and not rush to judgment in placing a label on a child and medicating him with a potentially hazardous medication (although medications can be helpful for some kids). Yes, the symptoms are real, but is there really a ‘’thing’’ called ADHD that is responsible? I have my doubts. (Note: all decisions regarding diagnoses and medications should be made in conjunction with your physician). Thomas Armstrong, Ph.D. has been an educator for over forty years and is the author of sixteen books including his latest: The Myth of the ADHD Child: 101 Ways to Improve Your Child’s Behavior and Attention Span without Drugs, Labels, or Coercion (Tarcher/Perigee). His website is: www.institute4learning.com and his Twitter handle is: @Dr_Armstrong.